For lobster lovers who can’t make it to the Maine Lobster Festival or who leave Rockland hungry for more, I strongly recommend a visit to the Winter Harbor Lobster Festival. Much smaller than the Maine Lobster Festival and a bit more of an expedition (unless you live Downeast), the Winter Harbor Festival offers a charming and authentic glimpse into the world of lobster fishing. 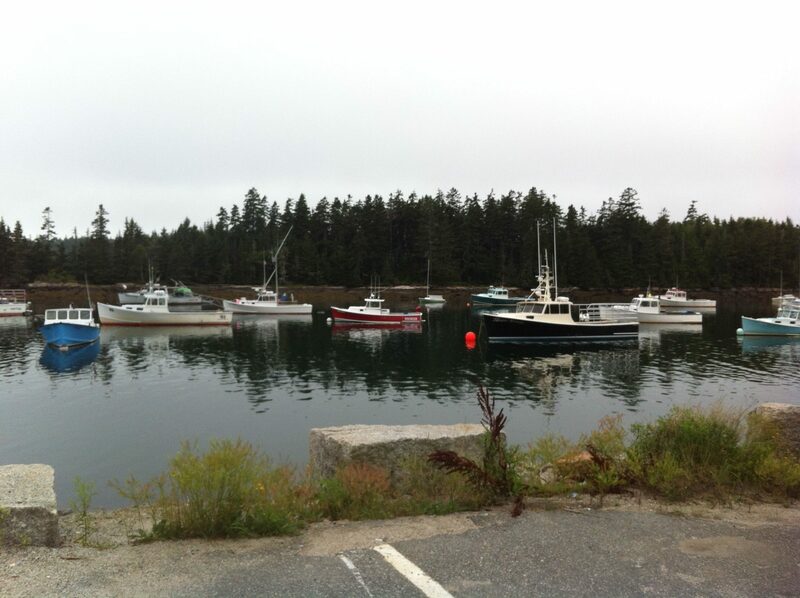 The enjoyment of the Winter Harbor Lobster Festival starts with the journey there. Once you peel off Route 1 and make your way towards the tip of Schoodic Peninsula, you pass by beautiful blueberry barrens, mossy heaths and sheltered coves. Route 195, one of the two roads leading to Winter Harbor, winds its way through pretty Prospect Harbor and past the old, iconic “Big Jim the Fisherman” sign. 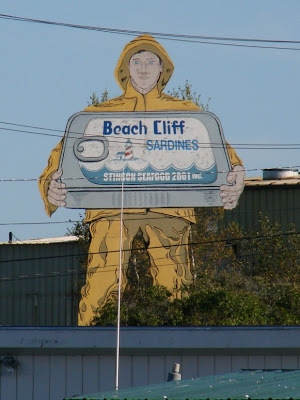 Stretching up over the village rooftops and into the sky, “Big Jim the Fisherman” was originally erected as an advertisement for the Stinson Seafood plant. Sadly Stinson’s closed in 2010. It was the last working sardine cannery in the United States. The plant has since been reopened as a lobster processing facility and the yellow-slickered fisherman, which used to hold a giant can of Beach Cliff sardines, now clutches a lobster trap. Once you arrive in Winter Harbor, you will be greeted with a classic, small town celebration which includes a pancake breakfast, lobster dinner, parade and lobster boat races. All of these activities are facilitated by local residents and take place in the relaxed surroundings of the town. Winter Harbor has a small but pretty Main Street which hosts a 5 and 10 and a few architectural gems, including the Winter Harbor Public Library (Channing Chapel). The fishing village also has the prerequisite weathered fishermen’s sheds with salt-crusted lobster buoys and a snug little harbor full of multi-colored lobster boats. 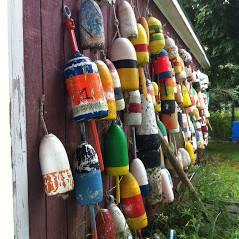 A lobster buoy shed in Stonington, Maine. In my youth, I attended the festival many years by boat to partake in the lobster boat races with my father. Several years ago, I enjoyed the festival as a flatlander and, over the course of the day, witnessed 900 pounds of lobster being served to satisfied diners. The lobster dinner, which runs from 11:00am until 3:00pm, is a central part of the festival. The year I attended, festival volunteers were piling plates high with steamed lobster, drawn butter, corn on the cob and fresh blueberries and cream for the bargain price of $15. You could also bag a lobster roll for the bargain price of $6 (at least a few folks could – by the time I’d made my way over to the stand they’d sold out)! Due to how the Maine lobster season is shaping up this year, the price of lobster dinners and lobster rolls will likely be higher at this year’s Lobster Festival. Here’s the latest Winter Harbor Lobster Festival schedule. If you make it to the festival, I’d love to hear what you think. And eat some lobster for me! If you’d like to read about more events this summer along the coast of Maine, including Stonington Fishermen’s Day, Friendship Day, the Eastport Pirate Festival and more, click here. 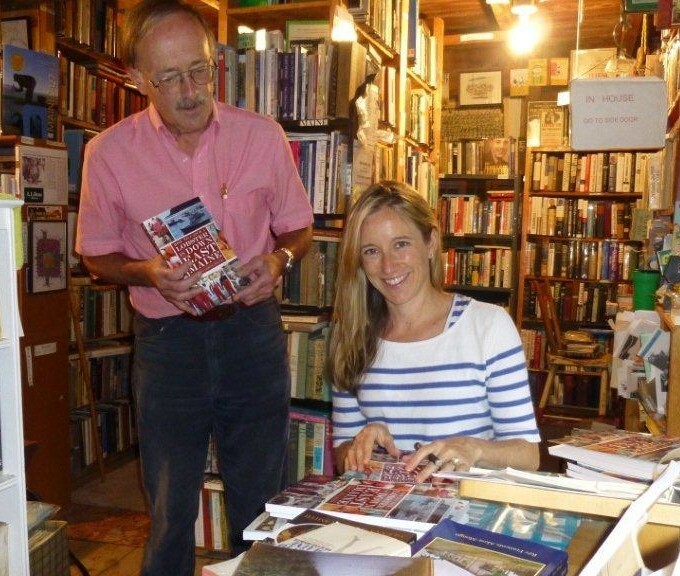 If you’d like to read more about the town of Winter Harbor, click here. When our daughter was much younger we used to tent camp at Oceanwood…the 1st year being unaware of the Winter Harbor Lobster Fest, our stay ended the day before…but for the next 6 or 7 years, we made our reservation so we could attend the WHLF…we loved everyone we attended…we’ll miss it again this year but we still have our memories of the pancake breakfast, craft show, Chipman/s 5 & 10, boat race, ice cream parlor, parade and of course the lobster diner…my 1st lobster diner I squirted lobster juice on two finely dressed ladies…I was mortified but those ladies were sooooooo forgiving…typical of the folks in Winter Harbor & the entire Down east….maybe that was the reason we returned so often.